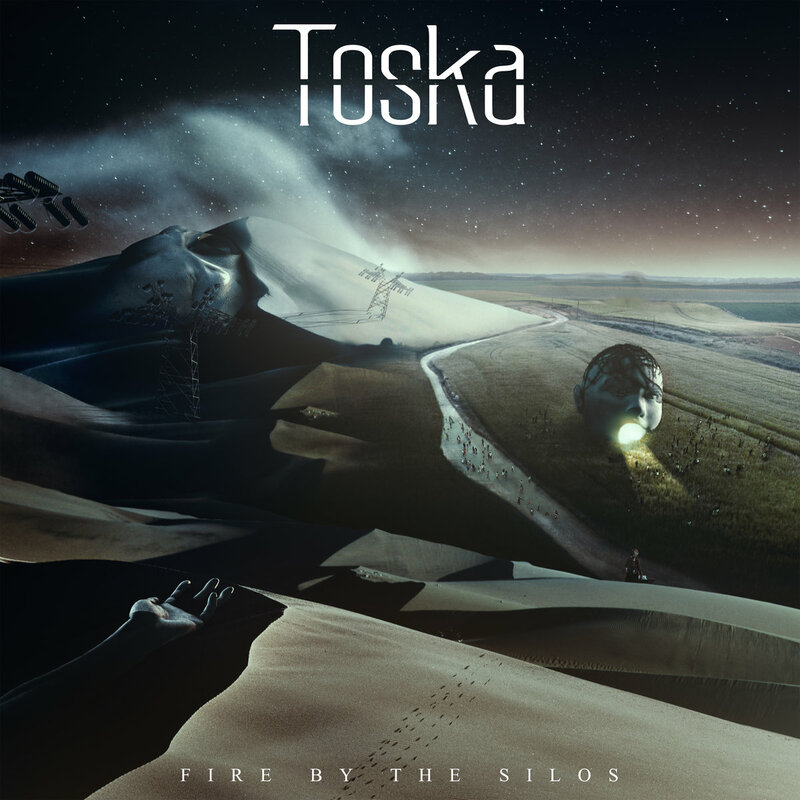 Prepare to have your definition of instrumental progressive metal shattered by Toska and their ambitious, apocalyptic sophomore LP, Fire by the Silos. Dust fills your lungs, kicked up by tires spinning away from where you seem damned to live or die. The heat is oppressive. The sky seems stuck in the murderous red of sunset, never mercifully granting the calm cool of night. Distorted orders blare through speakers that line the streets, still failing to drown out the din of disorder around you. I don’t know exactly what the end of the world will sound like, but the vision I tried to capture here is the scene that Toska‘s new full-length, Fire by the Silos, would the perfect soundtrack to. Rarely has an instrumental record created such powerful images in my mind, and what ominous images they are. Fire by the Silos is bookended by two tracks dominated by soundscapes – the enjoyably mirrored “The Herd” and “The Heard”. On the former, feedback bubbles and swells against hard-panned percussive clicks that are eventually joined by pensive guitars and unpredictable snare hits. Though lengthy, this ambient track sets the dystopian tone of the record before “A Tall Order” begins. At nine minutes, the song immediately establishes everything that makes Fire by the Silos so impressive – gargantuan riffs, excellent instrumental interplay, and an ability to create drama through excellently crafted musical ebbs and flows. The music alone, devoid of vocals of any kind, captures a sense of restless intensity, like being cornered, hypervigilant and hoping for an opportunity to escape that never comes. ‘Fire By The Silos is a concept album. An idea grown from social observation; looking at humans, aspects of the world, and the direction we’re going in. It’s set in the near future and focuses specifically on a person affected by great political and economic change, forced to lose everything. Fire By The Silos attempts to describe the psychological and emotional torment that takes‘. And it describes this torment perfectly. Though the entirety of the album’s seventy-one minutes cohesively form a central narrative, its musical climax is undoubtedly the penultimate track: “Prayermonger”. Voiceovers, creeping guitars, and anxious drumming explode into an indescribably haunting and awesome riff. It would be doomy if not for its bucking of traditional rhythmic trends, creating irreconcilably odd comparisons to Periphery, The Ocean, and Mastodon all within one section. And although these comparisons exist, they do not do so at the expense of Toska‘s unique voice. The band eschews pristine production, shred contests, and overstuffed arrangements. Instead, they offer a dramatic masterclass in sound design, narrative, and the potential of only three instruments to conjure apocalyptic visions in the mind of the listener. Of course, as is to be expected with the genre, Toska‘s ambition is weighty. Seventy-one minutes is long for any record. When you further consider that three of the album’s tracks are soundscapes with occasional voiceovers, and one track is a brief piano interlude, you hear the entire band on only five of the album’s nine pieces. This commitment to tone and narrative is impressive, even if it might frustrate some listeners looking for a more traditionally structured listen. However, I would encourage you to persevere; the 71 minutes of Fire by the Silos are so immersive and rewarding that the band’s decision to avoid traditional pacing makes perfect sense. And, by taking this risky route, Toska have crafted what is undoubtedly both the most unique and enjoyable instrumental metal record I’ve heard this year, if not longer. Next PostNoname - "Room 25"